Schmartboard is proudly located in the historic Centerville section of Fremont, California. Schmartboard is a member of the Fremont Chamber of Commerce and on the board of the Centerville Business and Community Association. Schmartboard is also involved in supporting local engineering education initiatives such as STEM, and in partnership withOhlone College and other local institutions. 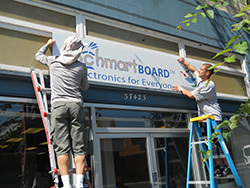 Schmartboard has chosen to operate from a retail storefront instead of a business park location with the intent of making ourselves more accessible to our customers and the community as a whole. Although we do not actively sell products at the location, we do operate as a "will call pickup" for orders placed online. (Please verify order is ready ahead of pickup) We also invite you to stop by and say hello to ask any questions on Schmartboard products or services or just to meet us. There is street parking, but we also have a large parking lot in the back, accessible from Maple Street.